EzGreensboro News & Record. EzGreensboro.com: What Richard Barron didn't mention in his News and Record article on Greensboro, North Carolina being the 7th largest renter eviction city in the nation, compared to the very media's often comparison; Greenville, South Carolina; Remember RUCO mayor Vaughan? 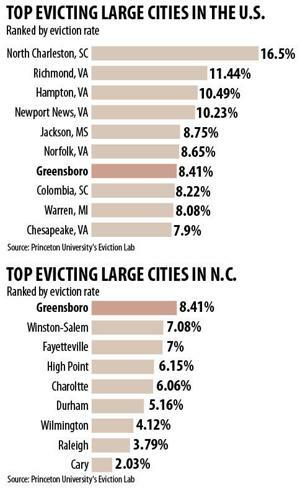 What Richard Barron didn't mention in his News and Record article on Greensboro, North Carolina being the 7th largest renter eviction city in the nation, compared to the very media's often comparison; Greenville, South Carolina; Remember RUCO mayor Vaughan? ...Nearly 5,000 renters were evicted here in 2016 — the most recent year available — according to a new survey by Princeton University's Eviction Lab. That ranks us seventh in the nation. With an average of 10 evictions a day in 2016, North Charleston, S.C., had the nation's highest eviction rate followed by Richmond, Va."
The racial makeup of North Charleston, South Carolina was 37.90% Non-Hispanic White, 46.69% Non-Hispanic African American, 0.34% Native American, 1.92% Asian, 0.12% Pacific Islander, 0.23% from other races, 1.90% from two or more races, and 10.89% Hispanic or Latino of any race. "As of the 2010 United States Census, there were 204,214 people residing in Richmond, Virginia. 50.6% were Black or African American, 40.8% White, 5.0% Asian, 0.3% Native American, 0.1% Pacific Islander, 3.6% of some other race and 2.3% of two or more races. 6.3% were Hispanic or Latino (of any race)." "As of the census of 2010, there were 137,436 people, 53,887 households, and 35,888 families residing in Hampton, Virginia. The population density was 2,828.0 people per square mile (1,091.9/km²). There were 57,311 housing units at an average density of 1,106.8 per square mile (427.3/km²). The racial makeup of the city was 49.6% Black or African American, 42.7% White, 2.2% Asian, 0.4% Native American, 0.1% Pacific Islander, 1.3% from other races, and 3.7% from two or more races. 4.5% of the population were Hispanic or Latino of any race." "As of the census of 2010, there were 180,719 people, 69,686 households, and 46,341 families residing in Newport News, Virginia. The population density was 2,637.9 people per square mile (1,018.5/km²). There were 74,117 housing units at an average density of 1,085.3 per square mile (419.0/km²). The racial makeup of the city was 49.0% White, 40.7% African American, 0.5% Native American, 2.7% Asian, 0.2% Pacific Islander, 2.7% from other races, and 4.3% from two or more races. Hispanic or Latino of any race were 7.5% of the population (2.5% Puerto Rican, 2.5% Mexican, 0.4% Cuban, 0.3% Panamanian, 0.2% Dominican, 0.2% Guatemalan, 0.2% Honduran)." "As of the census of 2010, there were 173,514 people, and 62,400 households. The population density was 1,562.5 inhabitants per square mile (603.3/km2). There were 74,537 housing units. The racial makeup of Jackson, Mississippi was 79.4% Black or African American, 18.4% White or Euro American, 0.1% Native American, 0.4% Asian, and 0.9% from two or more races. 1.6% of the population were Hispanic or Latino of any race. Non-Hispanic Whites were 18% of the population in 2010, down from 60% in 1970." As of the census of 2010, there were 242,803 people, 86,210 households, and 51,898 families residing in the city. The population density was 4,362.8 people per square mile (1,684.4/km2). There were 94,416 housing units at an average density of 1,757.3 per square mile (678.5/km2). The racial makeup of the city was 47.1% European American, 43.1% African American, 0.5% Native American, 3.3% Asian, 0.2% Pacific Islander, 2.2% from other races, and 3.6% from two or more races. Hispanics or Latinos of any race were 6.6% of the population. Non-Hispanic Whites were 44.3% of the population in 2010, down from 68.5% in 1970. From: Marlene Sanford - TREBIC (E-mail) To: Knight, Bill; "Trudy Wade"; Mary Rakestraw; Danny Thompson; Kee, James; Zack Matheny: Did Sue Schwartz out Robbie Perkins and Bev Perdue? Koury, TREBIC and RUCO: What could Regulatory Capture look like? Who did Greensboro’s Landlords Association PAC donate campaign cash to in 2009, and who do they want to castrate RUCO? by not lifting one finger to defend it. the day before a legislative vote in Raleigh and did not revisit the issue. the majority on this council simply lacked the will to fight for the policy. The RUCO board has traditionally been stacked with people associated with the real estate industry, who have made no secret of their desire to eliminate the program. Members of the board are appointed by council members, who are, in turn, generously supported in their election campaigns by people employed in the real estate industry. RUCO seems to work pretty well at its objective of making rental properties safer and more livable, and people who advocate for renters like it a lot, but some landlords and politicians don't like it as much so it might get changed. George Hartzman, referenced TREBIC influence; spoke to the representation and makeup of the RUCO Board; harming poor renters; and the makeup of the Greensboro Landlord Association. If Skip Alston was/is a slumlord, and Robbie Perkins company funds TREBIC, which wants to gut RUCO...?